Smoothies are a staple in our house year-round. My kids love to drink them, and I love that they are quick and easy to make, packed with superfoods, portable if necessary and fast to clean up. Babies as young as 7 months can enjoy smoothies, as long as they are made with baby-safe ingredients and are served in a way that they can eat it (we’ll get into that below 😉). 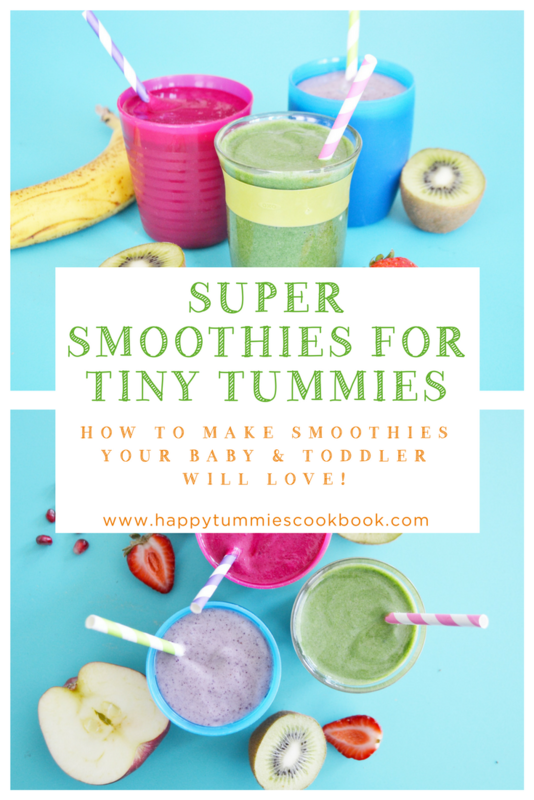 Check out my simple secrets and tips on how to make and serve delicious baby-safe smoothies whenever you want and fast. At the end, I’ve put together a list of some of my favorite baby-friendly smoothie recipes for some inspo! 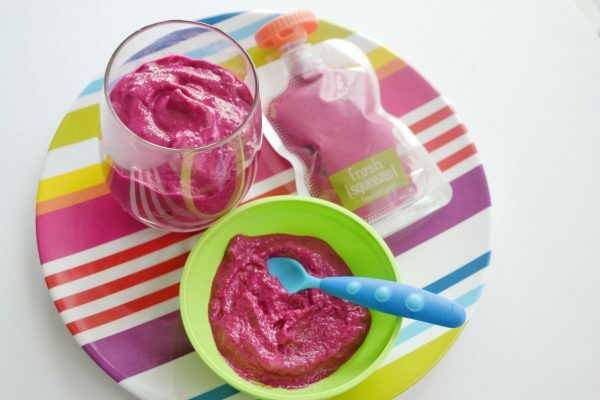 If you’re already making your own baby food, then making a smoothie for your little one will be a cinch! Stick to whole food ingredients, such as fruits, veggies and grains as the ingredients, and only use foods your little one has already tried before and has not had an allergic reaction to. 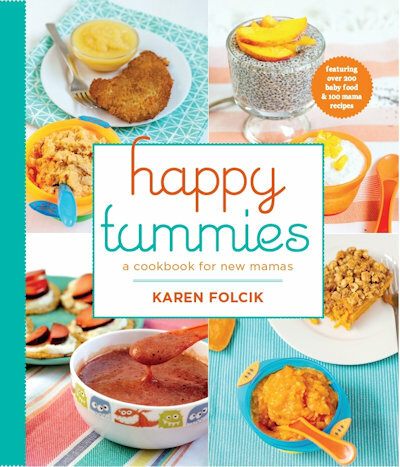 Stick to simple flavors at first, just as you do starting solids. For instance, make smoothies with just one fruit in it at first, then as your baby gets older and used to more foods, start mixing up the flavors with more combinations. 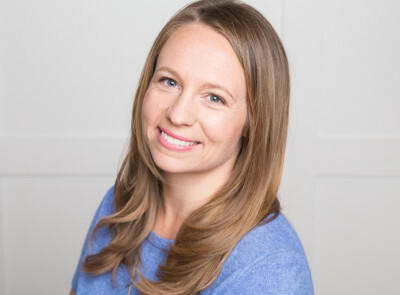 Check to be sure that all foods that you use are suitable for your little ones age (there is a handy cheat sheet that tells the order and age to introduce foods in the back of my book under Extras 😉). Once your little one has tried a new food, add it to your baby’s food diary, and then when it’s smoothie time you’ll have a whole list of ingredients to try! I love to use frozen organic fruits in smoothies when I can. They tend to be cheaper than fresh, and they are already prepped so you can just add them in and blend! 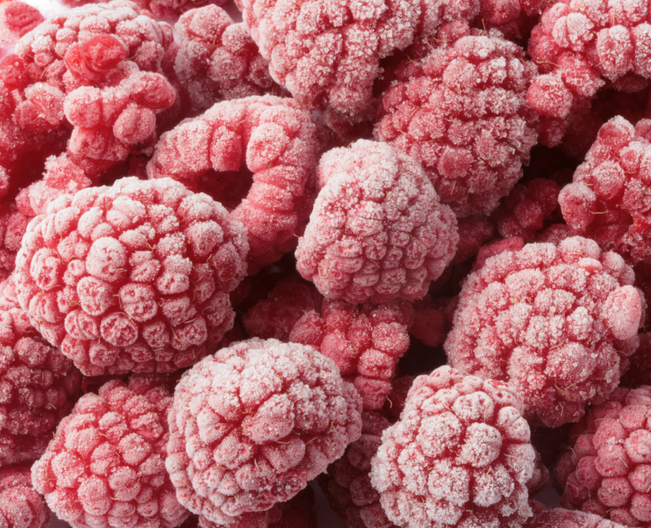 Our favorites to buy frozen are: strawberries, blueberries, pineapple, mango and peaches. Bananas also make an excellent smoothie base. I like to buy these fresh, then peel, break in half, wrap in foil and freeze. If I have a bunch of bananas that are turning brown and don’t have time to make banana muffins or bread, I always try to freeze them before they turn bad, that way I know they will be used and not just thrown out. For fresh produce, we love apples, pears and (peeled) oranges. I LOVE making fruit and veggies smoothies because most of the time (while I do like veggies), you just taste the fruit in the smoothie, and you can barely taste the veggie! This is a fantastic way to give my little ones nutrition, especially as they reach that toddler age when they either change their minds about what foods the like and don’t like daily, or just don’t want to eat anything but sweets and hotdogs. The trick to adding veggies into a smoothie without it tasting like a salad is to add just a little bit, and pair with fruit. 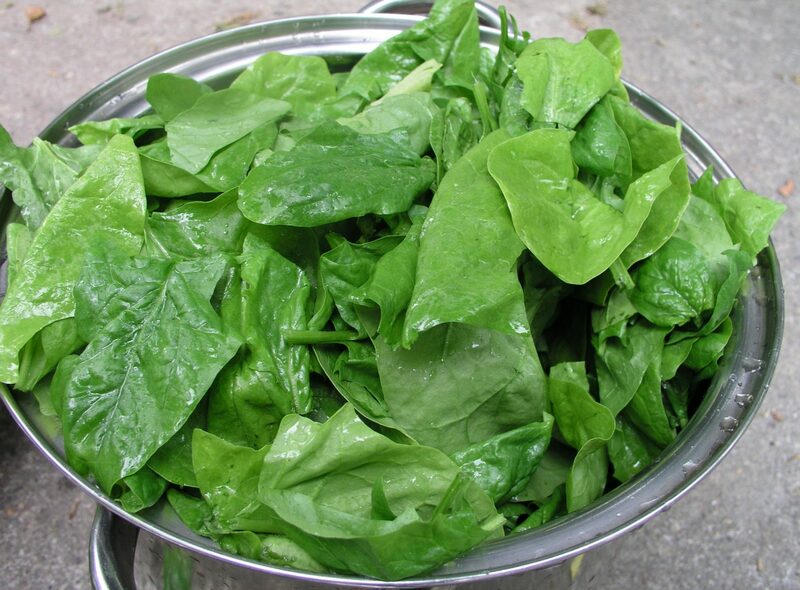 Every week I buy a container of washed baby spinach or kale because fresh greens to have on hand to add to our smoothies, muffins and pancakes (if you guys have not tried spinach muffins, go google it-NOW! they’re awesome!!). Some of our other favorites are: carrots, beets, cauliflower, avocado and squash. Superfoods are great additions to give smoothies a powerful health boost. They are loaded with vitamins, antioxidants and protein for growing bodies and minds, and can be fun to just add in for some variety and extra nutrition. Sometimes we’ll add in: ground flax seeds (safe for babies 10m+), chia seeds (10m+), leftover cooked oats, quinoa or brown rice, or pitted dates. Avoid adding in cow’s milk until your baby is at least 12 months old, as babies cannot process this type of dairy any early. Yogurt and cottage cheese is okay to give to babies 10 months and older. 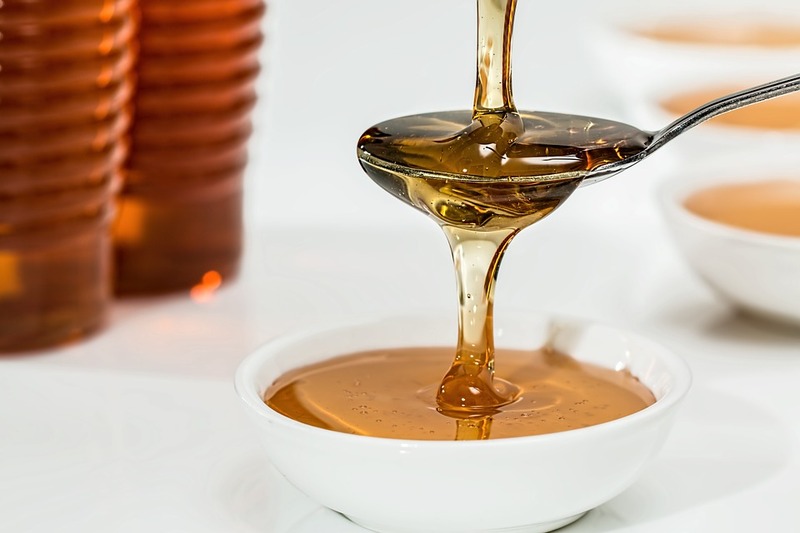 Also, avoid adding in any sweeteners or artificial flavorings such as honey, agave nectar, sugar or vanilla extract. Little ones are still learning about new flavors, so it’s better to sweeten with fruits in smoothies. Also, with honey there is the risk of botulism. 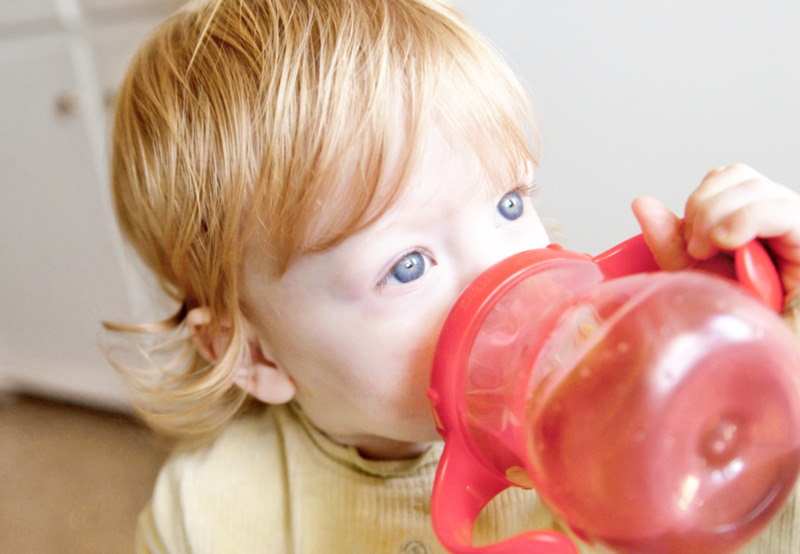 Filtered water is an easy option as the liquid in smoothies for babies under one years old. Though you can always use formula or breast milk if you are making a batch just for your baby for added nutrition! For babies over one year, milk, yogurt or non-dairy milk will (I think) blend and bind the flavors together better than water. Opt for full-fat, whole milk when choosing cow’s milk and yogurt for kids, as they need that fat in their diet. Plant-based eating is becoming more and more popular, so you have a ton of options in this department if you want to go that route for kids over one. 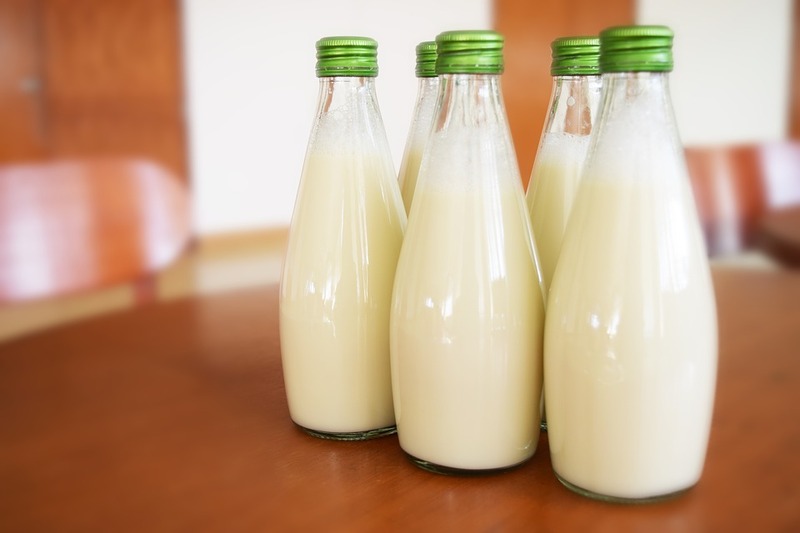 Some options are: almond milk (or other milk made from nuts), rice milk or oat milk. Since babies under one years old drink primarily from the breast or bottle, start off by serving smoothies just like you would a puree; in a bowl with a spoon. Or, for on-the-go, disposable pouches are handy because your little one can just take sips from it without having to worry about spoon-feeding. Once your baby is old enough and able to drink from a sippy cup (usually around 12-18 months), try serving smoothies in a sippy cup or in a cup with a straw. Tame the mess choosing a no-spill cup, and putting on a big bib. can I replace a feeding with a smoothie? Consider smoothies a snack, not a replacement for your babies breast milk or formula feeding. Even smoothies packed with every fruit and veggie under the sun are not as nutritious as breast milk or formula for a baby under one. Are you feeling ready to get blending?? 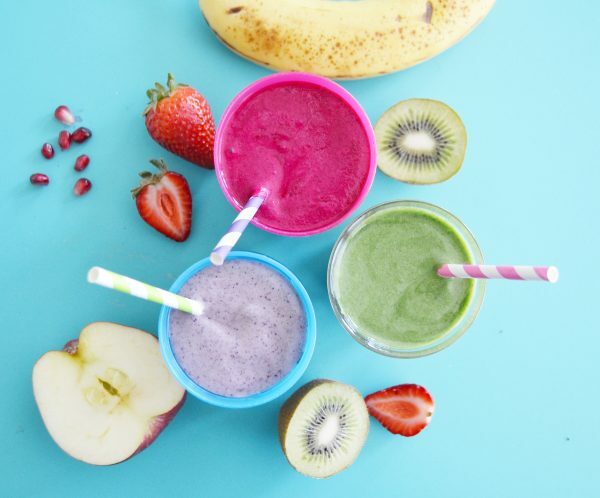 Here are three healthy smoothie recipes (for babies, toddlers and mamas!) in case you need some recipe inspo! Creamy, flavor-bursting, and packed with energy-boosting ingredients. 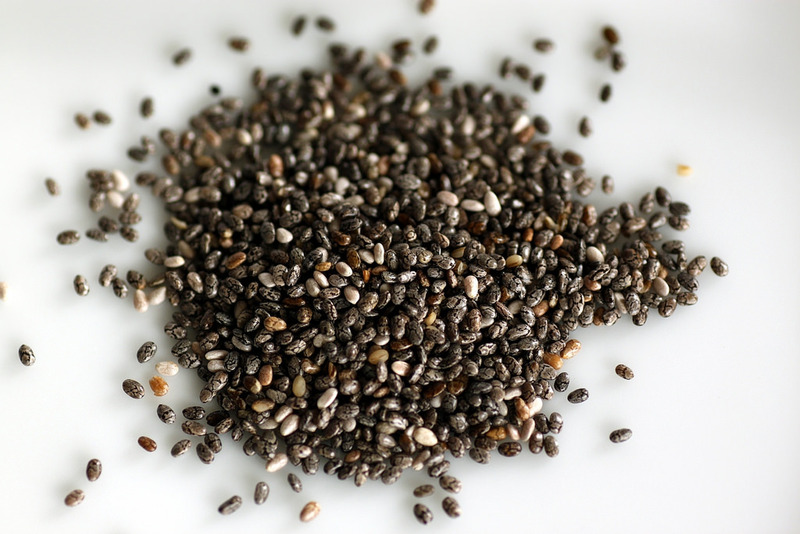 Omit chia for babies under 10 months. Place all ingredients into blender, and whirl together until smooth! 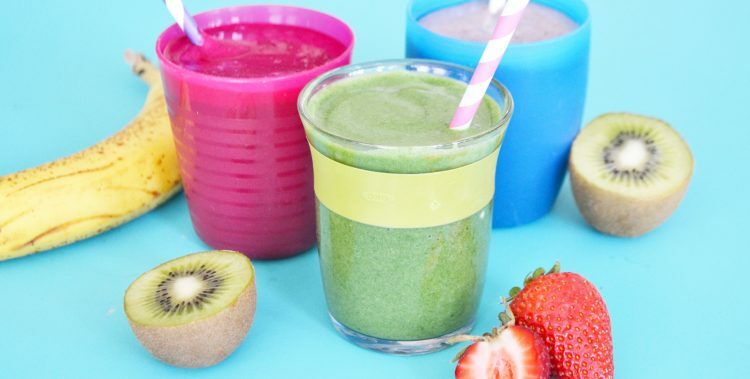 This good-for-you greens smoothie is mom and baby-approved! The flavor of the fruit masks the taste of the greens, so this is a fantastic way to give your baby crucial nutrition from iron, vitamins and phytonutrients. Place all the ingredients in a blender, and whirl until smooth! Cauliflower in smoothies have been all the rage in magazines and on social media lately. If you haven’t tried one yet, give it a whirl! I bet you’ll love it! Have a favorite baby-friendly smoothie? Share the recipe in the comments!